Our goal is to bring Gabe’s Chemo Duck Program to as many children living with cancer as possible. Chemo Duck enables hospital staff and parents to prepare children for chemotherapy treatment and eliminate the fear of the unknown. In a gentle, age-appropriate manner, children are exposed to life during cancer treatment and now have a friend to share the experience with. In turn, children can use Chemo Duck to help friends, siblings and classmates understand and empathize with their experience. By becoming a hospital sponsor, you will not only put huggable hope into the arms of one child but many. There are two ways to adopt a hospital. Logo and link on website. Wall Art to display at your office. Please contact lu@chemoduck.org for more information. 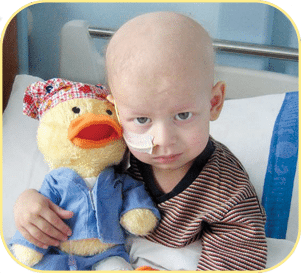 If you know of a corporation that is looking to support Gabe’s Chemo Duck Program to allow us to expand the program, as well as providing Chemo Ducks to children living with cancer, please contact info@chemoduck.org to customize a package that fits your needs. Please contact info@chemoduck.org to customize a package that fits your needs. For more information on hospital sponsorships, download our Hospital Sponsorship Packet.